As the foundation for my article, our text verse above plainly teaches that the salvation of a man is solely based upon the IMPUTED RIGHTEOUSNESS of God, and not upon a man's personal efforts or departure from sinful behavior. Eternal life is a gift (Ephesians 2:8-10). As you see for yourself in Romans 4:5, a man's FAITH IS COUNTED FOR RIGHTEOUSNESS; therefore, a man doesn't need any self-righteousness to be born-again. 1st Corinthians 15:1-4 defines the “Gospel” as Jesus' DEATH on the cross for our sins, His BURIAL, and bodily RESURRECTION three days later. Anyone who acknowledges their sinnership and BELIEVES the Gospel is saved instantly, irrevocably and eternally. This is “the simplicity that is in Christ” (2nd Corinthians 11:3). Before I begin rebutting David W. Cloud's article titled, “Biblical Repentance,” please notice that Mr. Cloud doesn't mention the words “impute” or “imputation” even once. I searched his website and couldn't find any explanation of what he believes about the doctrine of imputation. The same is true of heretic Ray Comfort, who teaches something similar to David Cloud's heresy on repentance from sinful activity to be saved. I don't think it is mere coincidence that these sincere men who corrupt “the simplicity that is in Christ” (2nd Corinthians 11:3), and turn the “free gift” (Romans 5:15) of God into a reward, avoid and fail to stress the Biblical doctrine of IMPUTATION. May I say, I admire Evangelist David Cloud for his zeal. I was supportive of his ministry many years ago, before I found out that he is a sworn enemy of Dr. Jack Hyles and teaches Lordship Salvation. Boy, did I wake up! Albeit, I like Mr. Cloud because he has guts and stands for what he believes! We are living in a weak-kneed generation of spineless, ear-tickling, back-scratching, lukewarm, preachers! David Cloud is anything but, courageously fighting for what he believes to be Biblical. Unfortunately, Mr. Cloud is wrong on repentance and salvation, which undermines his entire ministry. Tens-of-thousands of pastors, evangelists and Christian workers worldwide, particularly Baptists, are influenced and impacted greatly by David Cloud's writings, which makes him dangerous on a spiritual level. I do not question Cloud's sincerity, there's no doubt in my mind about that. But as author Mark Twain said, “It is easier to fool people than to convince them that they have been fooled.” Satan has fooled David Cloud. Kindly, here is some heresy that David Cloud teaches on his website . . . SOURCE: Biblical Repentance, by David W. Cloud, Way Of Life Literature, Inc.; June 13, 1999. As you can plainly see for yourself, David Cloud teaches “ANOTHER GOSPEL” (2nd Corinthians 11:3-4) from what the Bible teaches (1st Corinthians 15:1-4). According to what you've just read, if a man to whom you're witnessing mentions that he is not ready to cease from his particular sins, he cannot be saved. This is a false plan of salvation. Repentance in the Bible concerning salvation does not mean a willingness to stop committing them; but rather, the realization that one is a sinner in the eyes of a holy God, which compels a man to turn to Christ by faith to be saved. If eternal life is truly a free gift as the Bible states in Romans 5:15, then there can be no obligations as such. Forsaking sinful bad habits is a high price to pay for many folks. Literally, David Cloud is teaching that salvation is an exchange of sorts, where God will only save those who are willing to clean up their act from sin. This is so wicked and unbiblical. It is tragic that Baptists across the United State support David Cloud in his apostasy!!! David Cloud wrongly and inaccurately attacks Pastor Jack Hyles (1926-2001), accusing him of teaching a repentance that leaves off sin altogether. David Cloud states . . . The late Pastor Jack Hyles, First Baptist Church, Hammond, Indiana, who was an influential independent Baptist preacher, defines repentance to mean turning from unbelief to belief. He stated this in his 1993 book, The Enemies of Soul Winning. One chapter is titled “Misunderstood Repentance: An Enemy of Soul Winning.” He builds his doctrine of repentance largely on human reasoning: since unbelief is the only sin that sends men to Hell (so he claimed), unbelief is the only sin that must be repented of. That sounds reasonable, but it is contrary to the clear example and teaching of the Word of God. Biblical repentance as preached by John the Baptist, the Lord Jesus Christ, and the Apostles, involved a change of mind TOWARD GOD AND SIN. Here is proof that David Cloud doesn't know what he's talking about, and has grossly misrepresented Pastor Jack Hyles (who 100% correctly and Biblically states concerning repentance) . . . SOURCE: Pastor Jack Hyles (1926-2001), a quote from the timeless MP3 sermon, THE GOODNESS OF GOD LEADETH TO REPENTANCE! Clearly, Dr. Hyles recognized repentance unto salvation as the recognition of one's self as a guilty sinner in the eyes of a holy God. Romans 3:19, “Now we know that what things soever the law saith, it saith to them who are under the law: that every mouth may be stopped, and all the world may become guilty before God.” Notice in Romans 3:19 that the intent of God's Law is to show man his GUILTY CONDITION because of sin, and not the requirement to cease from those sins as a prerequisite to be saved. Ironically, in a different article on David Cloud's website, he clearly seems to understand that salvation is without works, yet he fails himself to distinguish justification from sanctification (which he hypocritically accuses Roman Catholics of doing). . .
Rome's gospel is a confused combination of faith plus works, grace plus sacraments, Christ plus the church. It redefines grace to include works. It confuses justification with sanctification. It confuses imputation with impartation. David Cloud's gospel is a confused combination of faith plus works, grace plus forsaking sinful behavior!!! Although Mr. Cloud mentions the word “imputation” in the preceding quote, I couldn't find anywhere on his website that explains what he actually believes about imputation, unless you buy his book on doctrines. Mr. Cloud is guilty of the same thing he accuses Catholics of doing, that is, corrupting the Gospel by adding works to grace!!! Hypothetically speaking, what if I handed you a birthday gift, but required you to wash my vehicle and stop drinking beer for 3-months to receive it? Would it really be a gift? Would you consider it a gift? Of course you wouldn't! So why is salvation any different? My friend, it is not any different. God calls eternal life a gift. Romans 6:23, “For the wages of sin is death; but the gift of God is eternal life through Jesus Christ our Lord.” A gift cannot be merited or earned. A “gift” is a gift, and there can be no stipulations or obligations, other than to simply take it. In Cloud's article on Biblical Repentance, the word “gift” is mentioned 14 times, but only in quotes (most of which he is using to bolster his heresy); Cloud himself doesn't mention the word even once. The terms “imputation” and “gift” seem to be offensive (inconvenient at least) to the proponents of Lordship Salvation. The truth is that IF a person didn't repent, they would never come to Jesus at all. A person comes to Christ for salvation because THEY HAVE REPENTED. It is heresy to recognize repentance as meaning anything more than the admission of one's sinnership in God's holy eyes. I see church websites, which errantly present the plan of salvation as: “1) Admit to God that you are a sinner; and then 2) Repent of your sins; have a genuine change of heart toward sin and your God.” This is a false plan of salvation!!! It is theological heresy to add the requirement to have a change of heart toward sins to be saved. 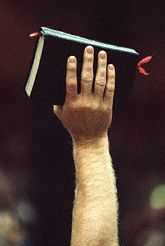 It may sound good to a religious person that repentance means a change of life, but that is NOT what the Bible teaches. Mark 1:15, “Repent ye, and believe the Gospel.” The Greek noun for “repent” in Mark 1:15 is metanoia. It simply means, “A change of mind.” And please notice that the OBJECT of thinking different is to “BELIEVE THE GOSPEL.” The Bible doesn't say to “think differently” and cease from sinful behavior. No, it says, “think differently” and BELIEVE the Gospel. The junk theology being taught by David Cloud is nothing but Calvinism repackaged into his own terms. Either way, the burden to change one's life is placed upon the sinner's shoulders (if they want to be saved to go to Heaven); whereas the Bible teaches that Christ alone bore the total weight of all our sins on the cross. Any plan of salvation that places the weight of sin upon the sinner's shoulder is a false Gospel. Jesus bore the total weight of our sins, so that eternal life could be freely offered as a gift. Whether David Cloud likes it or not, God saves THE UNGODLY (Romans 4:5-6). God does not save the REFORMED, nor the REHABILITATED; but only, THE UNGODLY!!! It is wickedness to teach a prospective new believer (they're still unsaved), that the only way God will save them is if they intend on ceasing from their pet sins. Where in the world does David Cloud come up with this false idea? This is NOT the Gospel. This is NOT “the simplicity that is in Christ.” David Cloud is teaching religion, but not the new birth. Perhaps you ask, “Shouldn't salvation bring about a change of behavior in a person's life?” The new creature (or change) is the indwelling presence of God's Holy Spirit (Romans 8:9). 2nd Corinthians 5:17, “Therefore if any man be in Christ, he is a new creature: old things are passed away; behold, all things are become new.” Please notice that this is AFTER a man is in Christ, not BEFORE as a prerequisite to be saved. David Cloud teaches that a person cannot be saved unless they first have intent to reform. This is works for salvation, adding works to grace. You cannot mandate a changed life as a prerequisite for salvation. Mr. Cloud is putting the cart before the horse, demanding a commitment to turn from sinful behavior, as a requirement to be saved. This is Satanism!!! Mr. Cloud is as the wicked lawyers in the Bible. Luke 11:52, “Woe unto you, lawyers! for ye have taken away the key of knowledge: ye entered not in yourselves, and them that were entering in ye hindered.” The key of knowledge is the Gospel. David Cloud has also taken that key (Gospel) away, by substituting a Seventh-day Adventist form of teaching instead (read it and you decide). Ah, here we see the truth that salvation is REGENERATION, but then a new believer needs to be mentored by other believers (which is part of The Great Commission in Matthew 28:19-20), so that his or her life can be CONVERTED to be useful for serving God. The reason why there are so many professions of faith, but few result in mature churchgoing Christians, is our failure as Christians to fully carry out The Great Commission as we ought. We need to disciple new believers, “Teaching them to observe all things whatsoever I have commanded you” (Matthew 28:20). The problem is NOT “easy-believism” (which is the only way to be saved); but rather, failure to completely carry out The Great Commission. Churches today are more interested in entertainment and being fun centers.